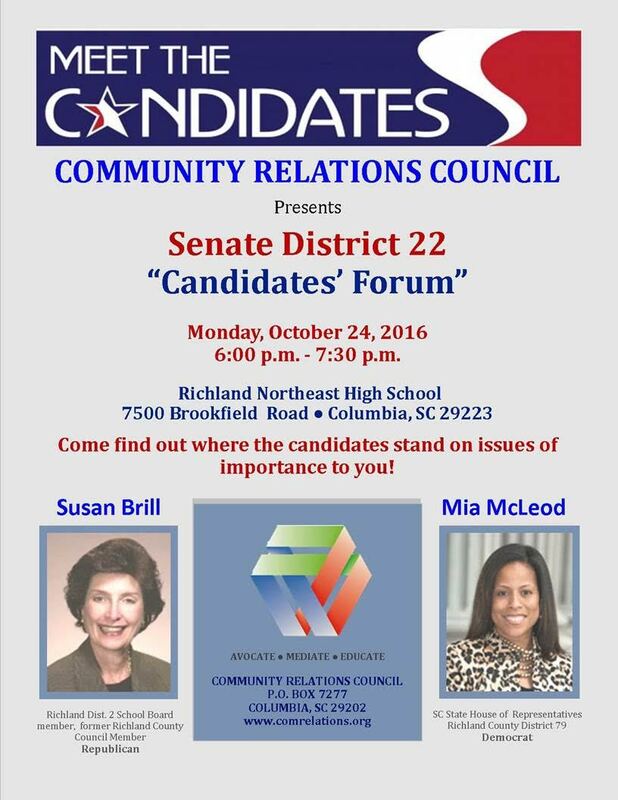 On Monday night at Richland Northeast High School, I’ll be moderating a debate between Democrat Mia McLeod and Republican Susan Brill, who are competing to replace Joel Lourie in representing state Senate District 22. The event is sponsored by the Greater Columbia Community Relations Council, of which I am a member. It will be in the school’s auditorium, and will run from 6-7:30. Y’all are welcome to come, especially if you live in the district. Also… I’ll be working on my questions over the weekend, so this is your chance to offer any suggestions you have along those lines. What would you like to ask these candidates? This is the only forum we’re doing for the general election. We selected it as the one truly competitive general election contest in the Midlands area. We may have missed some just as hot, but if so, I haven’t heard about them yet. This entry was posted in Debates, Elections, Legislature, Midlands, South Carolina on October 21, 2016 by Brad Warthen. I was reminded of that this morning, when I had breakfast with a Richland One candidate, and heard all about what’s going on there, below the reach of my radar. We never really talked about school boards at CRC when considering which elections we might use our resources to increase awareness about. Maybe we should have, but we’d have had the same problem we had at the paper. And someone else would have had to moderate, because I’m just not knowledgeable enough, and I’m not sure who would be (who was also reasonably neutral). I’m not knowledgeable (by my own standards) about the school boards because we never endorsed in those races — which would have forced me to interview every candidate and really dig into what was happening in those districts. Why? Well, not because I didn’t think they were important. I just could not figure out how to get it done. Even when there were eight, almost nine (counting a part-timer) people in editorial, it was beyond our reach. Only five of us, when we were most flush, were actually board members. And we always had our hands full just covering the contested races for governor, other statewide races, Congress, the House and Senate, Richland and Lexington county councils, Columbia city council, and all those countywide offices from sheriff down to the offices that we shouldn’t be electing, such as coroner. In a primary, that could mean more than fifty individual interviews, crammed into a six to eight-week period, on top of the rest of our work. We didn’t ALL sit in on every interview, but at least two of us were present at each, and all of us on the big races. Doing the seven school districts in the two counties would have doubled that load. Impossible. I really thought a LOT about ways to write about those races, because those were the ones the average voter knew the least about, and we could really perform a service if we could get them done. But I didn’t see how. I considered group interviews — inviting everyone running for a particular board to come in at once — but I didn’t think that would be valuable. It wouldn’t have given us the kinds of insights into individual candidates that we were used to. One year, I had Nina Brook, who was the associate editor covering education issues at the time, do a column each on the main issues in each of the seven districts. And she did a good job, and it was something, but not as helpful to voters as examinations of individual candidates would have been. There’s only one solution to this problem: We should have no more than one district per county. Then local media could really COVER the boards and make them more transparent, so voters could be more knowledgeable when they voted for them. Excuse that digression… it’s just been on my mind today. I hope there are questions regarding the Recreation Commission. Will either one accept responsibility for cleaning house in that department? Will they try to enact tougher oversight and nepotism rules? here’s a good question for them: what can you actually ACCOMPLISH in this position that goes beyond taking about doing something? Does she really believe that pro-life legislators (male or female) are motivated by a desire to micromanage personal and intimate medical decisions, rather than by a desire to protect human life? She may disagree with them on the issue, but if she can’t at least acknowledge their motivation, isn’t it she who is missing in the point? Yes. Yes, she does. And she’s one of millions who think that way. It pleases them to portray us that way. No, I don’t think I’ll go down that particular rathole. I’ll let the candidates get into Culture War stuff on their own, outside of the debate. It will be my goal to get the candidates talking about substance — infrastructure, Act 388 and tax reform, those sorts of things. I was planning on it, but my wife is going to a Bible study, so I’ll be home with the kids. I could try to take them… but that might be a disservice to the attending public. But remind me exactly where it is and when it starts. Last time I was in the RNE auditorium, I was giving out the W&L Book award to a rising senior. You can tell RNE places great pride in having W&L give out an award there because they seat the W&L alumnus with the Ivy League alumni (along with West Point) for the awards ceremony. Not like that ol’ school Mr. Jefferson started. I had to think a bit to realize you meant Washington and Lee. So do you Virginian alumni call William and Mary W&M? Or do you just not mention it? My wife is a W&M grad. She never says W&M, but she does write it that way for shorthand. We both agree our schools are better than UVA. I’d love to go, also since this is my Senate District. However, my wife has an after work event also, so I’ve got the kids tonight. Maybe Jeff and I should let the kids all get together and not watch it together. I’m sure, given a little research, I could come up with something Susan’s done that would awaken an equal level of scorn in me. The thing is, I’m about as neutral a moderator you could find, who is still knowledgeable enough for the job. Early on, I thought maybe I had a preference in this contest. Now, I’m not sure. I don’t know how I’d vote if I lived in the district. Nor do I know whom I would want to endorse, were I still the paper. I don’t envy Cindi at this moment. Mia: Are there issues within the black community that you feel you are more qualified to address than Ms. Brill? If so, what are those issues? Susan: Do you sense a change in the demographics of Senate District 22 and, if so, has it resulted in new challenges for Senators? Will MIa (the Democrat cadidate) get an advanced copy of the questions? What in the world would make you even think such a thing? Who do you think I am, and what on Earth have I ever said or done to make you ask me that? Although I did think about sending the questions to both camps,mainly because I’m unusual — I’m less interested in how people “think on their feet” than I am in how they THINK when given a chance to do so. Thinking on your feet is a parlor trick. Policymaking is about thinking more carefully than that. Well you are part of the media, and Hillary got advance copies of her questions. I just figured it was standard procedure. Yes it is, Editor Warthen, I didn’t do so good in english class in high school or college. I figured I was money ahead worrying about courses that could actually provide me with a decent income. Hardly. If you want to do any type of customer facing job, you BETTER be able to think on your feet. I could list hundreds of examples of occasions where if I said to a customer “Let me get back to you on that” that I’d be out the door very quickly. Knowing something well enough to be able to respond is a core competency. I say that as someone who in my youth was known as a champion bull____er. I got this reputation from my ability to get up and give a presentation before a class with ZERO preparation. If you go back and look at the messages written in my high school yearbook, you’ll see more than one friend describing me that way — which is kind of embarrassing to me, looking back. Over the years, I’ve sort of controlled that impulse, and been more willing to admit when I don’t know something. I may even overdo it, if it’s a subject I’d just rather not discuss. Based on my protestations of ignorance, y’all probably think I know less about money, or football, than I actually do. This results occasionally in people explaining ridiculously simple things to me, assuming I don’t know. And you know what? I don’t think she was giving me her theory. I think she really knew this stuff….